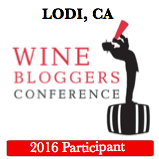 I feel slightly guilty about not writing anything for this website since November. To be honest, there wasn’t much to write about over the holidays, and pitches in my inbox have not been very interesting or have not been a good fit. So I decided to come back with something very personal which I would enjoy writing about and definitely love reading many times over the years. Please indulge me as I recall the most perfect weekend of my life (so far), March 17-20th, 2017, our trip to Las Vegas, Nevada, where Andy and I got married. We flew out on St. Patrick’s Day (Friday) on Southwest Airlines directly to Las Vegas from Sacramento, which is probably one of the easiest and shortest flights in existence. I ran 10 miles that morning (it was weigh-in day) and I was doing everything I could do look good for the ceremony (planned for Sunday), so I didn’t have the free cocktail offered to us on the plane (it was only about 3:30 when we took off, and a little early for me anyway). 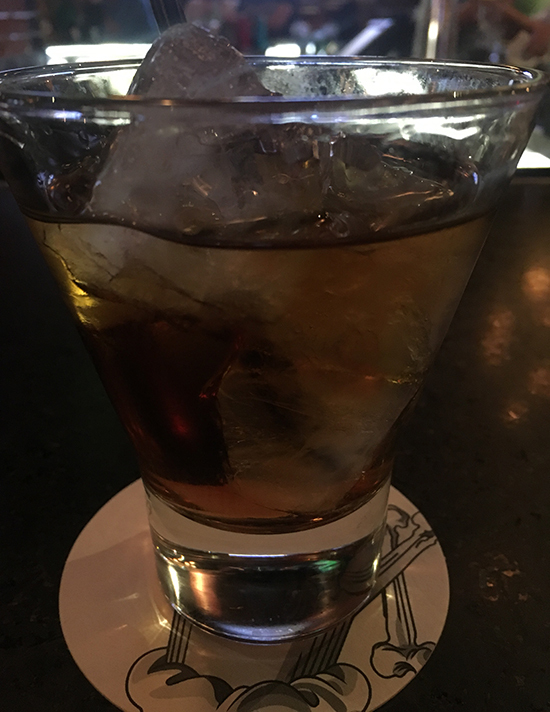 Thanks to a late(r) check-in, we didn’t get to sit together––Andy was sitting directly in front of me––and I was sandwiched in between two guys in their twenties, passing the time by doing a crossword puzzle (which is one of my go-to things to do to occupy myself on an airplane). People are so weird with their window/aisle seat obsessions. I was admittedly overly annoyed with having to sit between two “bros” and not be able to sit beside Andy. It’s just that I love our time together and know that it’s finite. I already don’t spend enough time with him because we both work so much. I love the person he is while we are on vacation. Andy really likes to have fun when it’s time to have fun. I love that about him. I love sitting beside him and looking over at his profile and his face and I love holding his hand. I love it that he kind of ribs me about stuff. But, I love that he makes me laugh sometimes when I least expect it. Anyway, I just sat there in my seat and prayed that the flight would be done soon and that my wedding dress (which I had checked in the larger of the two suitcases we checked) would arrive with me along with my designer dress I rented and all of my cosmetics and skincare products. See, it takes a lot to make me look like a girl…I mean, Industrial Light and Magic would shudder at the job. I was on the verge of hiring a team for hair and makeup for this trip, but ultimately I decided I had enough faith in my own skills. We landed soon, and I was reunited with Andy. We were able to find our luggage right away and get the rental car fairly quickly. Our trip to Las Vegas was a package deal with flight, hotel and rental car all rolled into one cost. I think it was around $1500. I tell you that only because I want to look back ten years from now and laugh/cry about how affordable this trip was. Our hotel reservation was for the SLS Hotel and Casino, mainly because we wanted to see a show at the same hotel on the next evening. And not just any show, but Saturday Night Live alumni Dana Carvey and Jon Lovitz. We figured it would be so great to have dinner at our hotel, then walk across the casino into the nightclub to see two of our favorite comedians, and then be able to walk back to the elevator to head up to our room. We stayed on the 19th floor, room #311933. We arrived at the restaurant around 7:30-7:45, and there was probably a 30 minute wait. We really didn’t give a damn. We were both so happy to be in Las Vegas and all checked into our hotel, and to be at Guy Fieri’s restaurant. To all the Guy Fieri haters, I don’t know what you’re mad about. Maybe you’re just extremely jealous. For me, I find Guy Fieri’s story extremely fascinating. Andy and his mother actually met him during the Tex Wasabi days in Sacramento. 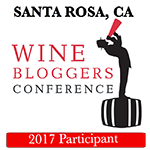 I saw him live at a food and wine festival and thought he was very entertaining. I am not sure what all the negativity is about. At the bar, we were actually excited to wait for a table amidst all the St. Patrick’s Day partying and shenanigans of others (which were actually entertaining to watch, as we could see a lot of people were having bachelor/bachelorette parties). While we waited for a table, I had a vodka and diet coke (came with one of those giant ice cubes I like), and Andy had a white wine blend. We were seated fairly quickly and again, I just remember being so excited about the weekend to come (and all the food and beverages, OK, that, too)! We decided that we would order the Triple T Fries (because I am obsessed with Truffle flavored anything). 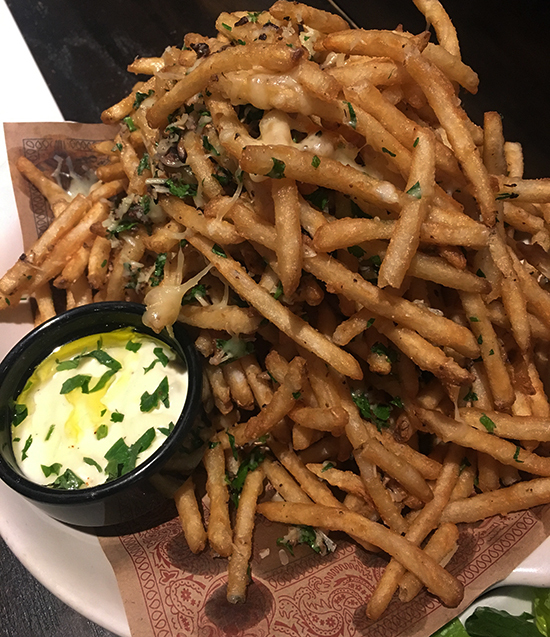 The description on the menu is as follows: Julienned-cut fries tossed with black truffle & truffle infused gouda, served with a creamy white truffle dip. 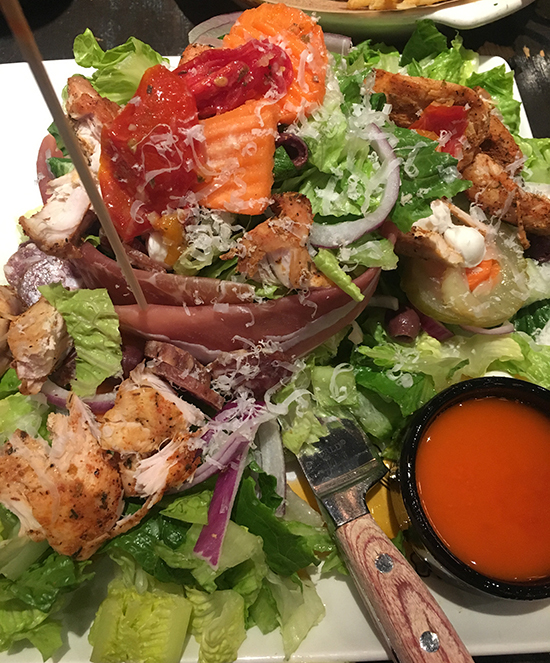 For my entrée, I ordered the Italian Deli Salad (crown of prosciutto-wrapped smoked provolone, imported Italian meats and cheeses, romaine lettuce, olives and pickled Italian veggies with chicken breast added). The prosciutto was the largest piece I have ever seen and very thick. I thought I was taking the light way out by getting a salad, but I can imagine Guy himself laughing in my face at my attempt. 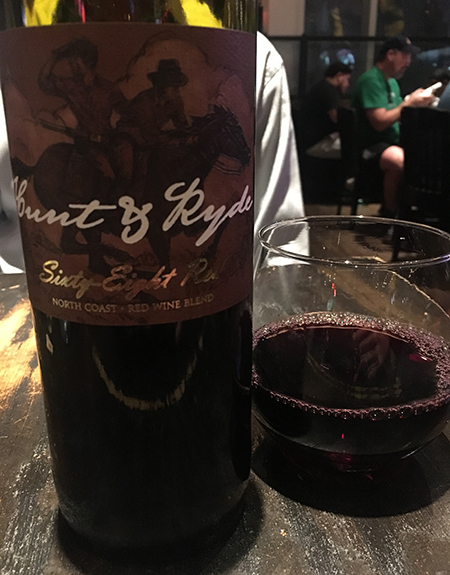 Andy ordered the Flat Iron Steak and Smashed Potatoes (8 oz. 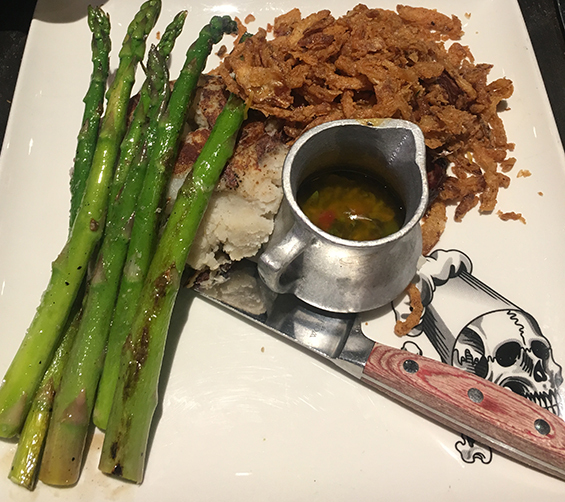 prime flat iron steak, seared and sliced with garlic smashed potatoes, grilled asparagus, onion straws and chimichurri sauce). 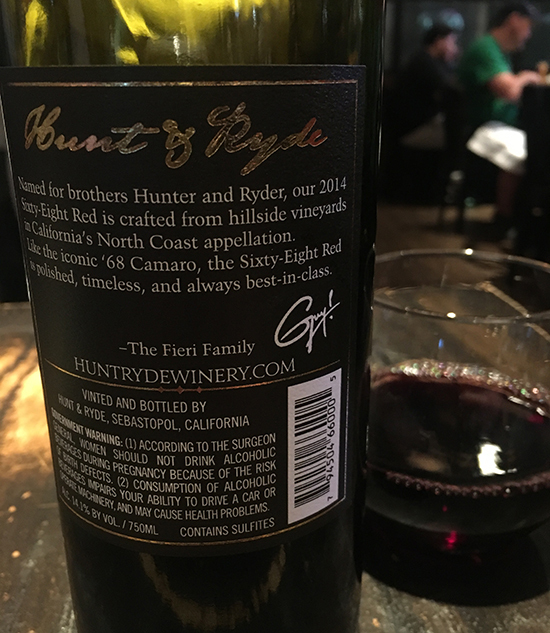 And to pair with our meal, we ordered a Red Wine Blend by Hunt and Ryde Winery, produced by Guy Fieri and named after his sons, Hunter and Ryder. We had to call it a night fairly early because we had business to take care of the next day (workout, wedding license, tuxedo rental) before dinner and the show we had come to Las Vegas to see: Dana Carvey and Jon Lovitz: Reunited, so we headed back to the SLS Hotel immediately after dinner. The next day, we were off to the Clark County Courthouse to get our marriage license. And that’s where I will pick up with Part Two of We’re Married! This entry was posted on April 14, 2017 by cavegrrl. 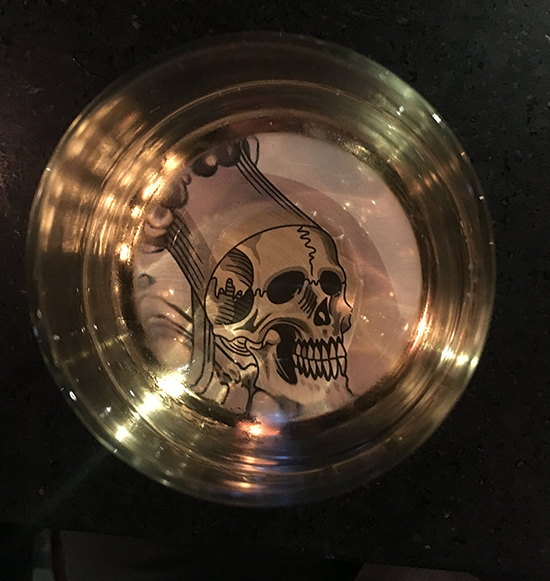 It was filed under food, travel, wine and was tagged with food, Guy Fieri, Hunt and Ryde Wines, Las Vegas, married, SLS Hotel, travel, wedding, wine. So happy to hear all the details of your amazing weekend. At one point Neal and I talked about getting wedded by Elvis in Vegas or having a voodoo wedding in New Orleans.